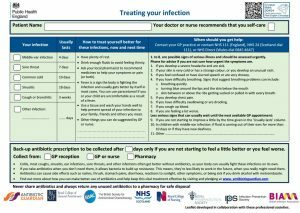 The Patient Treating Your Infection leaflet is a useful tool for clinicians to use within consultations for patients who do not require an antibiotic prescription for their infection. It includes information on illness duration, self-care advice and advice on when to re-consult. 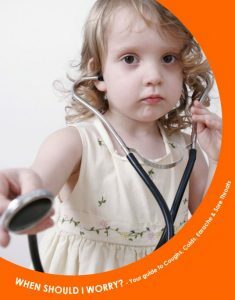 Use of this leaflet has been approved by PHE, RCGP, BSAC, NHS Scotland, RCN, IPS and BIA. 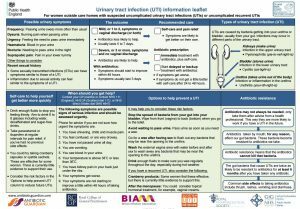 The Patient Urinary Tract Infection (UTI) Information leaflet has been designed to be used during consultation with women who are experiencing non complicated UTIs. It is a useful tool for clinicians to use where the clinician feels that the patient does not require an antibiotic prescription. It includes information on illness duration, self-care advice, prevention advice and advice on when to re-consult. Use of this leaflet has been approved by PHE, RCGP, NHS Wales, Scottish UTI Network (SUTIN), RPS and BIA. 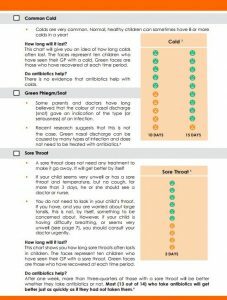 The booklet can be downloaded free of charge from the When should I worry? website www.whenshouldiworry.com. Practices can also order colour glossy booklets (in bundles of 50) from the RCGP bookshop.